When I go outside for a walk with my camera, I pay a lot of attention to the things around me, and I usually decide if it’s worth to take a picture in a situation or not. But to be honest, sometimes I just take a photo without thinking a lot about it, I talk about random photos that I take spontaneously. This can happen if I am curious how the photo would turn out, if I want to see something up close later on the computer screen, if I am experimenting, or just for the fun to press the shutter button. You maybe know what I mean, I don’t always have a clear idea nor do I always know if I will be happy about the photo when I see it on the screen. You can see one of these photos in this post, a photo of a rook bird. The only thing that made me take the photo was that I was literally on eye level with the bird. The photo was possible because there were two ways, the paved walkway where you see the bird, and a sloping and sandy path beside it where I was walking. This made me think it could be an interesting shot, and it was the only reason why I shot the photo, which means it was just an experimental photo to me. But I’ve been impressed immediately at home when I saw the photo on the screen, there are a few things that I really like about the photo. I mentioned already the first reason, I’ve been on eye level with the bird, and I really like this type of photography. Then it is a close-up photo and you can see details, I like that too. I am happy that the subject is somewhat nicely isolated, and only the fence in the background is a little bit distracting. 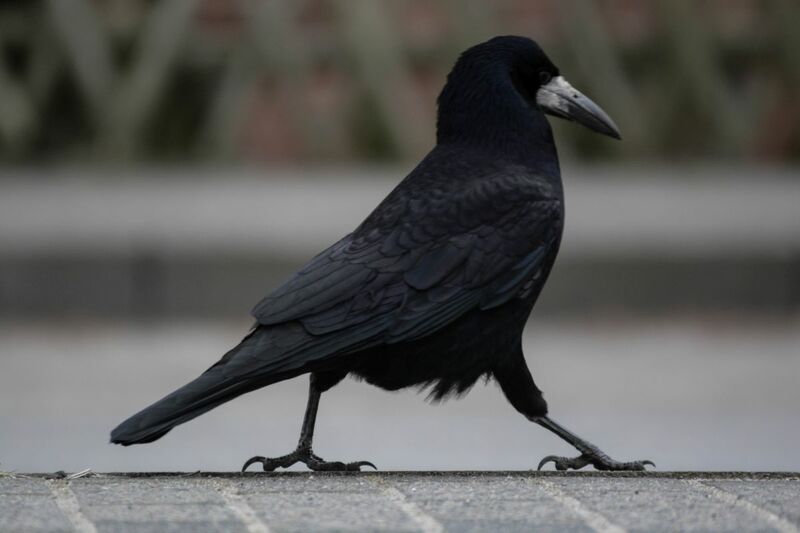 I do also like the simplicity of the scene, it’s just a rook, but the rook is walking in a direction, the legs and claws show the direction. I am pretty much happy with the photo, it was almost just a random shot, but it turned out so well in my opinion, and I am really starting to like bird photography. It is an interesting photo. I like that you were on the same level as the bird and I don’t think I have seen many photos of birds walking in that way. I have snapped a few pictures of birds myself while on holidays mostly so I can look them up when I got home as we saw some gulls and ibis. The rook almost seemed to copy us humans. The bird walked like a human step by step over the walkway, not like other birds with small steps, that was so funny. Not only this, I walked up to the paved way after I shot the photo, and then bird was totally unimpressed and walked at my side. Situations like this one make me laugh about how some birds adapt to the town life 🙂 I think rooks, gulls and pigeons are great examples here. I think you are right and after Sydney I would include Ibis in that list of birds that have adapted. The ones in Sydney are so used to people that they will try to take your lunch right out of your hand. 🙂 I probably will upload my gull pictures later possibly on Sundays. Good shot. Nice to see the bird strutting his stuff at eye level. Our local ducks and swans are very tame, too. The swan come right up, obviously looking for a handout … and the ducks will pretty much climb into your lap in the hopes of a treat. I saw this behaviour with our ducks and swans too, especially those in a city, not so much in the nature of course. I should mention that this is a brilliant photograph! Classic! Thank you Marilyn, random shot, but at home I started to love this photo too.